Terms, phrases, definitions and terminology relating to Tequila. The “heart” of distillation, containing the best flavors and aromas for tequila, and the most preferred portion. This is the middle part of the distillate and the main portion that actually becomes tequila. An aromatic herb used in several liqueurs, including some made with tequila and agave, plus other beverages and fruits. The plant grows in arid zones of Sinaloa and Baja California Sur. Demijohn - Commercial unit for retail, made out of glass covered with straw, fat, with holders, which contained 32 liters, that is, the count of one barrel. Agreement reached May 27, 1997 between Mexico and the European Community. The law that establishes the specifications required to produce, bottle, distribute and sell tequila, to protect and maintain the Denomination of Origin. According to the "Appellation de Origin Controllee" (AOC), tequila can only be produced in Mexico. In the wine and spirits industry there are only four drinks recognized with Denomination of Origin: sherry, cognac, champagne and tequila. Distillation. The process of heating the fermented must (mosto) and condesing the resulting steam to extract the alcohol. Tequilas and most mezcals are distilled twice, while some brands go through a third distillation to enhance purity. Some mezcal areonly distilled once. After distillation, the alcohol is filtered. Cutting the flower stalk (quiote) from the maturing agave to make the piña grow fatter and richer with carbohydrates. Also called castrating the plant. Distintivo T (Distinctive T) - An award presented by the Tequila Regulating Council (Consejo Regulador del Tequila). In order to receive the highest category of Distintivo T, there are several requirements including - the establishment must serve a minimum of 60 brands of authentic certified tequila and at least three dishes with tequila as an ingredient., have trained staff dealing with tequila, and all empty tequilla bottles destroyed. A town and municipality within the state of Jalisco, situated near Amatitán. 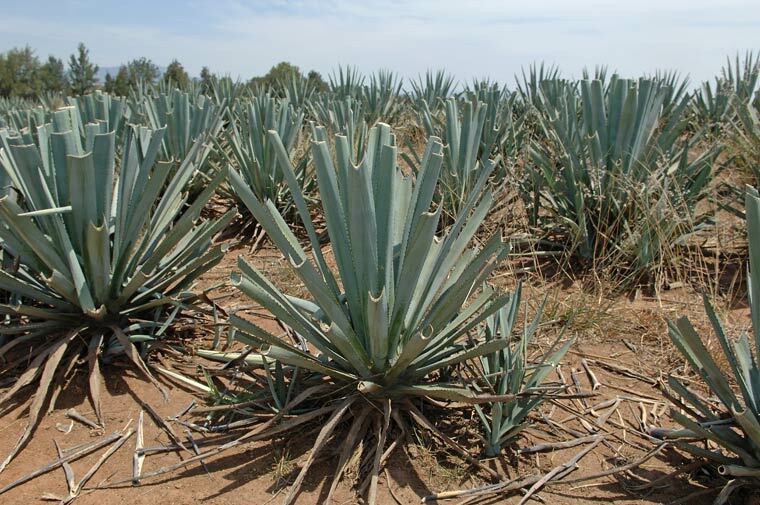 A liqueur made with agave liquor - often tequila - and other liquors made from fruit or flowers, such as damiana. This is the newest classification or type of tequila. Utra-aged or Extra Añejo tequila has been aged for a period of at least three years, without specifying the aging time in the label, in direct contact with the wood of oak (holm or holm oak) or Encino oak containers with a maximum capacity of 600 liters. Defined as a factory, plant, mill or distillery. Another term for a tequila distillery. Fermentation. The formation of alcohol from sugars by the action of enzymes. In the tequila process the sugars come from the roasted agave piñas, and the enzymes is the yeast added to the sap or “mosto”. The yeast acts upon the sugars aguamiel converting them into ethyl alcohol. Also known as “Joven Abocado,” this gold, young Tequila develops an amber hue from the oak casks in which it is stored. This is an unofficial term used to describe 100% Agave tequila rested in wood barrels for twice as long as most Resposado but not as long as Añejos. 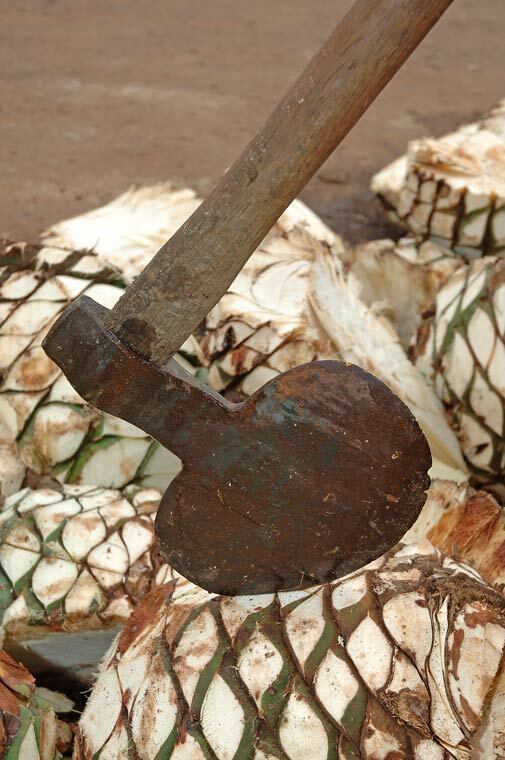 A type of hatchet, axe or chopper used by the Jimador to split the agave piñas. Similar to a Coa but with the blade at a 90 degree angle with the handle. Made in Mexico. Should be printed on all labels of 100% agave tequila. Kettle of boiler. In some caldrons, the pipe where the water boils. Shoots or "Pups". Baby agave offshoots that grows from the base of a mature agave, which are replanted and grow into mature agave plants. They are pulled up and trimmed at about one year of age. 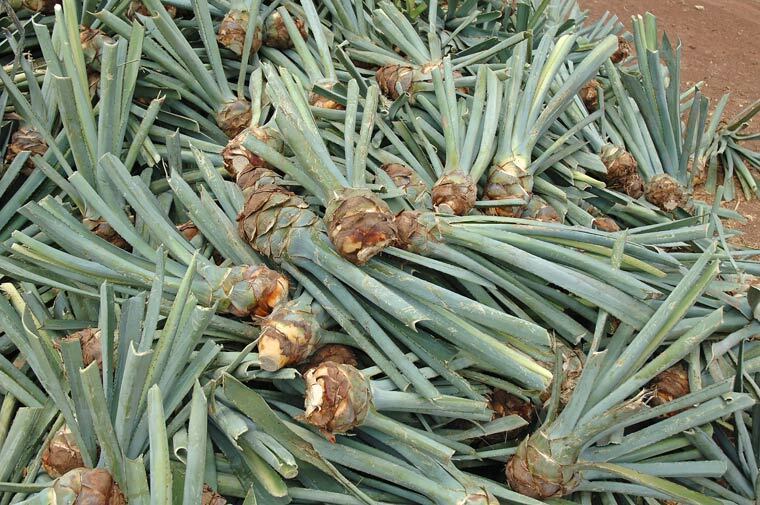 It is the preferred form of propagation for most agave plants. They are also called seeds or mecuates. A butterfly larva, also called a worm. It lives in the heart or leaves of agave plants. It is sometimes placed in bottles of Mezcal, but never in tequila. There are two kinds of worms - gusano de oro (gold) and the more prized gusano rojo (red). The traditional oven used to cook agave piñas. Fiber. The textile-like fiber that is extracted of the agave leaves in order to produce lines, strings, cords and paper. It is called also pita.